Dental traumas are common and frustrating. It is even more frustrating during Holidays and weekends as most clinics are closed. Emergency departments in hospitals are often not equipped to restore, “fix”, a fractured tooth. Having served Lux Dental, in Quincy MA, for over a decade, I have treated numerous trauma patients during nontraditional operating hours. This afternoon, we had the pleasure of seeing a 28-year young female, with the complaint of a tooth fracture. She did not report trauma and only realized the fracture today. Upon examination, her lower left first molar was fractured. 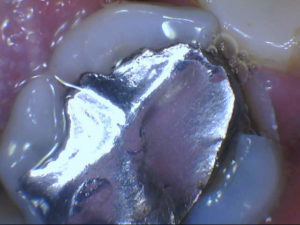 The tooth composed mostly of amalgam, commonly known as a “silver filling”. The fractured tooth was vital (cold test). I must confess, I am a fan of amalgams. They are not tooth colored, yet amalgams perform well. This kind of filling is time-tested, reliable and strong. So why the fracture? There are numerous potential causes. Trauma being a primary etiology. Trauma comes in many forms. The fact that she grinds her teeth places a lot of stress on the dentition. Ordinarily, teeth touch one another daily for approximately 5 minutes. In the case of a bruxer, it could be hours. Having photographed and explained to the patient the potential causes, we had recommended a customized occlusal guard. This will protect her from grinding. Our next step is to provide the appropriate restoration of the fractured tooth. The patient’s options are to do no treatment, leave the tooth as is. Place an even larger “filling”, or design a custom crown. A crown is a simple restoration that covers the whole entire tooth. Think of it as a 360-degree armor. A crown protects the tooth in its entirety. Crowns could be synthesized using a variety of materials. Gold being my favorite. Gold is malleable, as a noble metal it is nonreactive. Gold was not acceptable to the patient. A white crystal-like material was utilized instead. 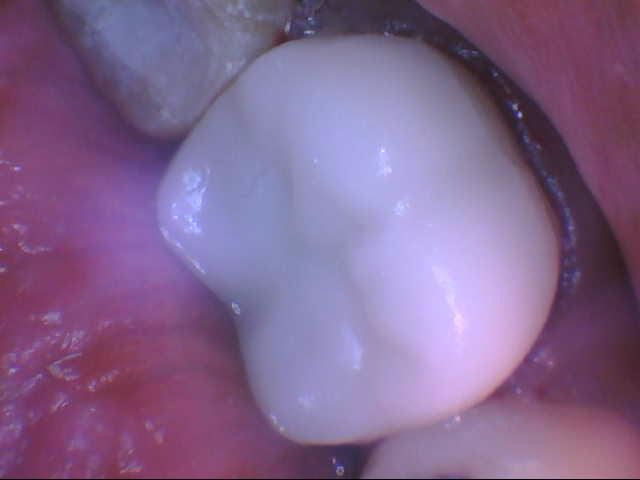 With CEREC technology, we were able to “fix” this tooth in a single visit. Cerec is a 3D printing system. Through advanced imaging, together with the patient, we were able to design the new crown.